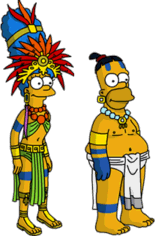 The Simpsons Tapped Out has received a minor in game update on iOS and Android, which introduces Mayan Marge, while unlocking some previous items which you may have missed. You can get the Yard Sale 2014 update and gain access to the new content by simply logging into your game. The size of some of the buildings and items has changed. 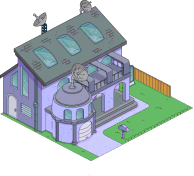 Helter Shelter, Ultrahouse 2, Mr. Sparkle Billboard have all reduced in size. The Cool Brown House gives 100 XP when built when it used to give 10. Since it’s premium now, it builds in 6 seconds when it took 4 hours before. It’s also “Raising Pretentious Kids” every 5 minutes instead of 4 hours. The Mayan Calendar (available as part of the Mayan Bundle) gives 250 XP when placed rather than 0. It also can now be placed on the beach, boardwalk, grass and pavement. 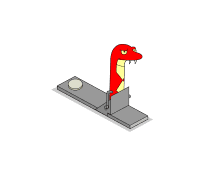 The Ninja Homer Practice Snake gives 120 XP when placed rather than 10. It costs 100 donuts instead of 120, and can be placed on the beach, grass or pavement. Father Sean is now a premium character and earns at a premium rate. Similarly, the Mayan Homer, Cool Homer, Gorgeous Grampa and Bare Chested Willie skins earn at premium rates. 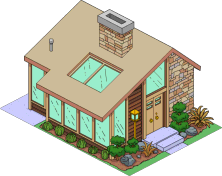 The Ultrahouse 2 gives 90 XP when placed rather than 50. They’ve also finally fixed the bug where it didn’t have a conformity rating (it was a typo in the files) and now it contributes 10 points to Indolence. It also earns at the premium building rate of $200 and 22 XP every 8 hours. 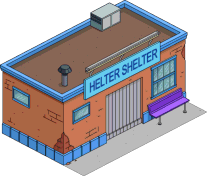 Helter Shelter gives 45 XP when placed instead of 10. It also takes 6 secs to build now that it’s a premium building. Its job of Providing Basic Necessities now earns the premium rate of $500 and 45 XP every 24 house. Unfortunately, it still doesn’t contribute to conformity. 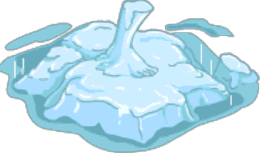 The Ice God Statue is premium now, gives 30 XP when placed, and costs 30 donuts. It still earns the same 2.25% bonus. The Liberty Bell now gives 1000 XP when placed rather than 0. A strange change to make, since the July 4th event has ended and the Liberty Bell is no longer available. If you spot anything else, let us know!